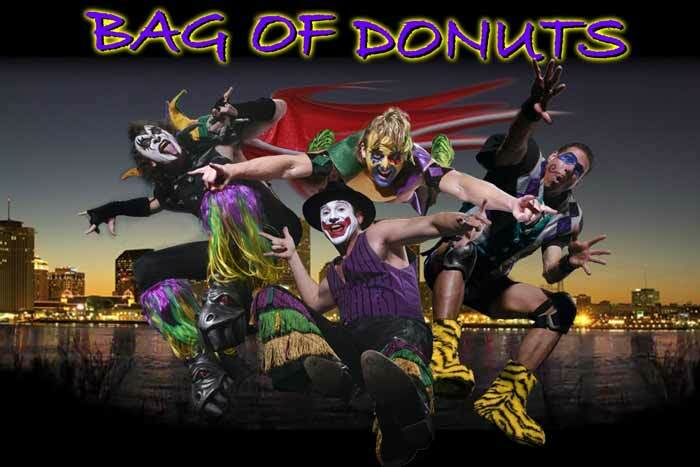 Bag of Donuts bring the PARTY! Bag of Donuts cover a wide variety of music from the 1960’s through today’s top of the pop charts, including TV shows, commercials and movies. They are a New Orleans based quartet known for their wild stage antics, outlandish costumes and strange renditions of popular songs. Since their creation in 1988, they have entertained and “offended” thousands of people by stealing their hearts as well as other peoples’ songs. 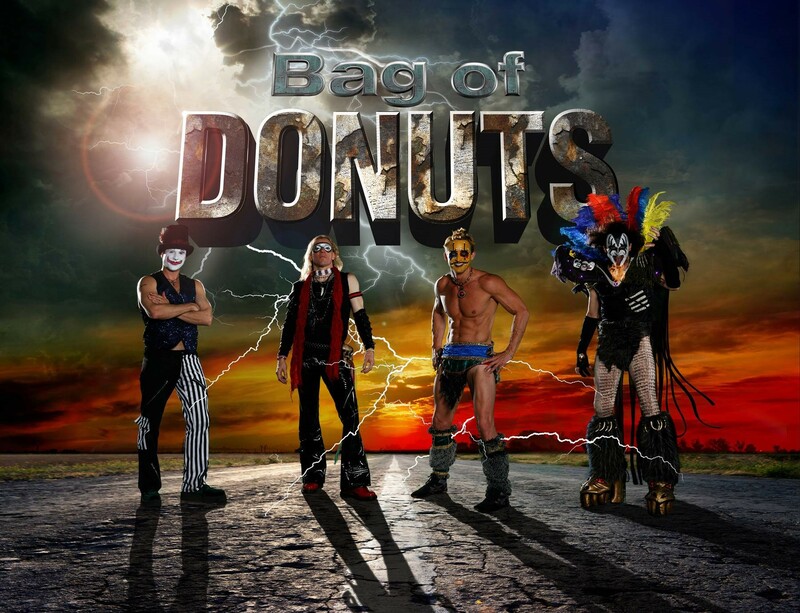 Bag of Donuts remain a professional band with an outstanding reputation. They’ve won numerous awards throughout their animated history and perform 100 plus dates a year. 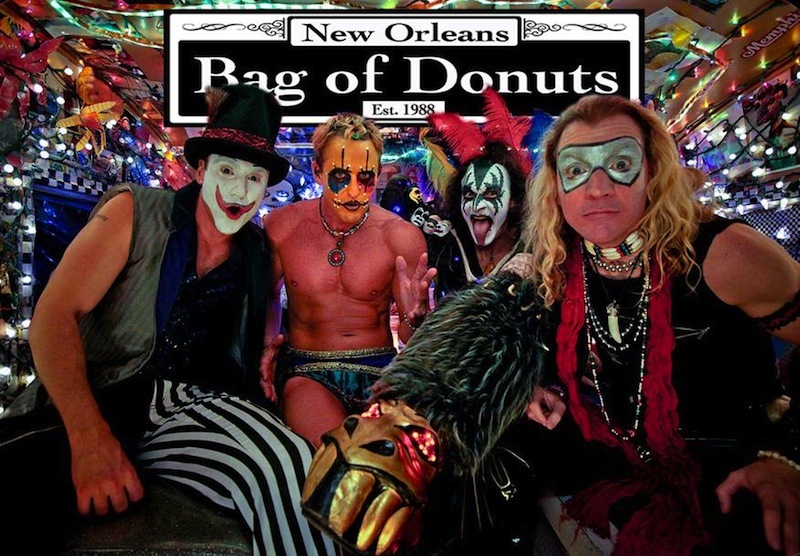 In March of 1999, the Donuts released their debut CD “Glazed and Confused.” Two years later they released their much-anticipated live CD, “Live in New Orleans,” recorded at a sold out show at House of Blues. 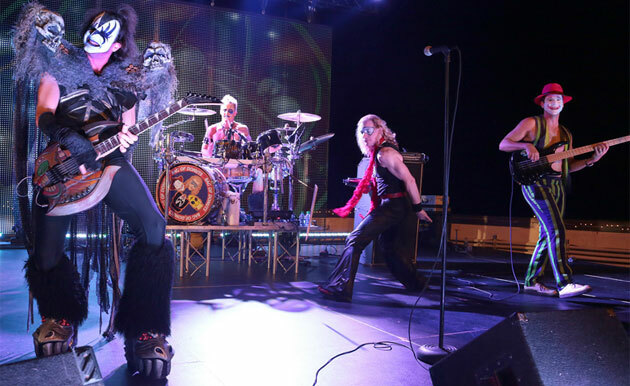 The band reinvented themselves in January 2011 with the change in front man Bobby Hoerner and the release of their EPK in August of 2011. The New Orleans based quartet have been engaged in such endeavors for over two decades. Having celebrated their 25th anniversary in 2012, the momentum only seems to be building. Along with their flair for kabuki make-up and extravagant costumes, the four New Orleans natives cover songs in a style they have branded as Superpop: Any song popular from any era. Their flamboyant performances are a combination of ultimate showmanship, call and response audience participation, visual ingenuity, professional musicianship and pure entertainment with a nod to the comedy gods. With over 100 live dates each year, BOD have become headliners at festivals from Texas to Florida including an annual slot at the world famous French Quarter Festival which surpassed 700,000 attendees in 2014. Further building on that propulsion, New Orleans Magazine named them one of the most popular local acts along side Grammy winning heavyweights, Rebirth Brass Band. Their performances draw thousands at events for NFL, NBA and PGA. In addition, there is always a salute to their hometown which is at the heart of BOD’s charm.